Pictured below is Alvaro, lead accordionist from Pinata Protest. The San Antonio-based Mexican “conjunto punk rock-y-roll” band played in San Diego last February, I believe – fuzzy on the exact date but it was this year, pretty sure, and the crowd really like them. I was surprised because there were a group of four or more young redneck looking construction worker types milling around the front of the mosh pit by the stage as the band was getting set up and they didn’t look very friendly, kind of crazy, actually. One of the dudes, all white guys, sauntered over to me as I waited with my camera off to the side of the floor and he proudly told me Alvaro had given him the Pinata Protest rocking Mexican skeleton t-shirt he was wearing and that he and his friends were from Riverside, or some cow-turd place like that, and they had come to see Pinata Protest, “because, you know, they’re Mexican.” He said this smiling, adding a strange emphasis tour the word “Mexican.” No offense meant, Riverside dwellers, but seriously your town is awful unless maybe if you like death metal. Anyways, these guys were jumping around the front of the mosh pit at Pinata Protest like caged apes, aping around, and one dude especially, who was a Robert Alton Harris (former CA deathrow inmate) lookalike only shorter and with a smaller moustache, kept casting wide-eyed menacing glares at Alvaro and the other little Mexican Pinata Protest band members and punching his fist into his open palm like he was revving up for a fight yet it was also part of his mosh dancing. I could tell it was getting to Alvaro because as a lead accordionist it was kind of his job to engage the crowd with eye contact, but he was only looking down at his accordion, and if there’s a group of drunk dooshbags that look like they want to lynch you I’m sure it gets on the nerves. The other band members were laughing but looked like they were concentrating on their instruments too. He commented on it eventually, saying into the microphone something like, “It’s nice to be here in San Diego at Brick by Brick and I hope I don’t get beat up.” But he was a calm trooper and channeled that nervous energy into a rocking set. The crowd generally really cheered and hooted as he went into his big epic lead accordion solos. Jeff, their absentee tour manager from Saustex Records, pulled some major strings from remote as he was on tour in Baton Rouge or someplace and got me the press pass for the swanky joint that is Brick by Brick so I was able to get this thrilling photo for you, dear readers. For I am your dedicated music reporter, Reviewer Rob. The original digital photo was in color but it had a lot of red so I liked it better in black and white. 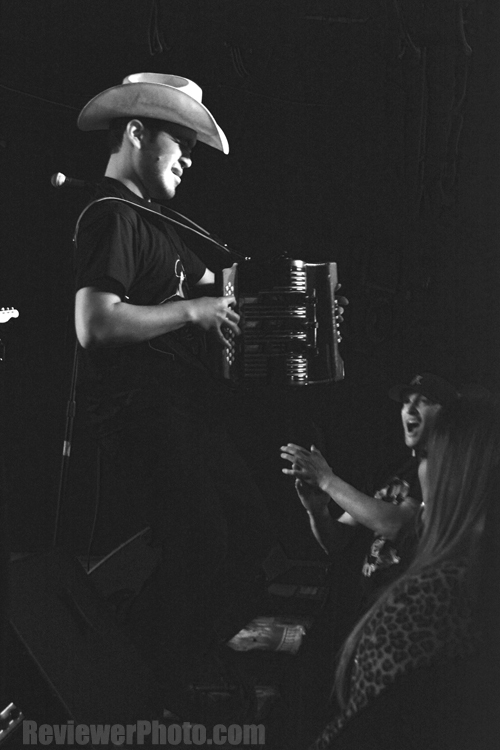 Alvaro, lead accordionist from the San Antonio, TX, conjunto punk rock-y-roll band Pinata Protest, playing at Brick By Brick in San Diego in 2014. Photo by ReviewerPhoto.com.